Silk Mark Expo underway in Guwahati at NEDFI House, Guwahati. 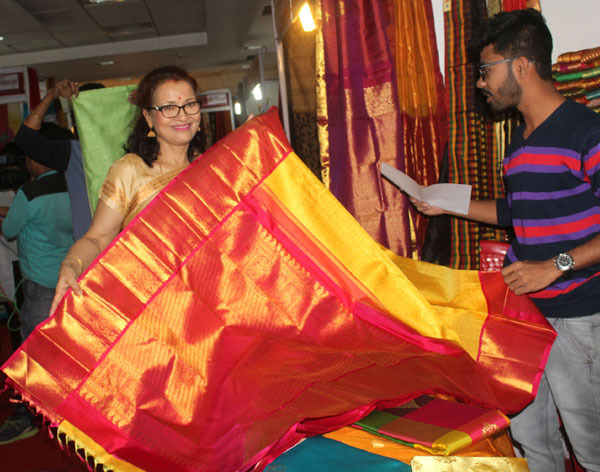 The five-day Silk Mark Expo which is underway in Guwahati, has been organized by Silk Mark Organization of India (SMOI) and sponsored by Central Silk Board, Regional office, Union Ministry of Textiles. The Expo was inaugurated on April 4 by National award winning Assamese actress Moloya Goswami who urged people to buy only pure silk so that the interest of sericulture farmers was protected. SMOI is an initiative of Central Silk Board to protect the interest of the sericulture farmers and also that of the consumers and safeguarding the purity of silk via introduction of Silk Mark Labels, SMOI Regional Office Executive Mamata B Sarma said. Silk Mark Expos organized across the country has been a huge success in terms of participation, awareness of Silk Mark, involvement of local entrepreneurs in Silk production and business, Sarma said. This event is an ideal platform not only to popularize Silk Mark labels and provide valuable linkages to all the stake holders in the silk industry, but also to encourage local entrepreneurs to start silk business. There are more than 3700 authorized users of Silk Mark and over 290 lakh Silk Mark labelled products in the market.